Jimmy Palmiotti tells MTV that he was flabbergasted by sight of seeing a comic he has co-written come to life. "We were pretty blown away. I know everybody says it's wild to see something you write about brought to life, but Justin and I were walking on air." 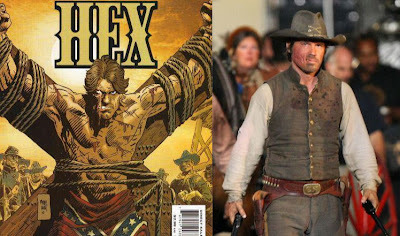 Palmiotti says he was able to meet a majority of the actors in "Jonah Hex" but was pleasantly surprised when he was greeted by Hex himself on horseback. "We get to the set and there on horseback is [Josh] Brolin in full Jonah Hex makeup with the hat and the coat on." He continued to exclaim Brolin's look for the film. "He just walks by us slowly on the horse and looks down at us, and I have to say -- he looks amazing," Palmiotti said. Palmiotti reveals that the production has done it's best to really capture the look from the comic. He said, "Everyone was so nice and up to date on the books, so much so that in the film, the art director used a lot of our books to set up the scenes." He also said that one of his own stories has been included in the film. He revealed, "The cover of the comic with Jonah on the cross -- the cover by Jordi Bernet -- that's one of the scenes in the movie." (Cover pictured above) Palmiotti who seemed extremely excited about the film and the way it is shaping up, was also able to see one scene which included how Jonah Hex got his facial scars.